Of course, all Annie's boxes basically taste the same, so the real test of quality is the shapes. Of course—to be clear—there are no bad ways to eat mac and cheese, but here is how you should consider them. We would sum up the spirals with two letters: eh. They just haven't got much going for them. They don't have the novelty appeal of the wacky shapes, the familiarity of the elbows or the cheese-holding capacity of the shells. Their one major asset is their slurpability; there's nothing like the feeling of a spiral untwisting as you slurp it. The classic macaroni and cheese shape gains points for familiarity. It's smooth and slippery in the best way. It's a great vehicle for the cheese sauce, which pools in its holes. It's good; it's just not Annie's good. 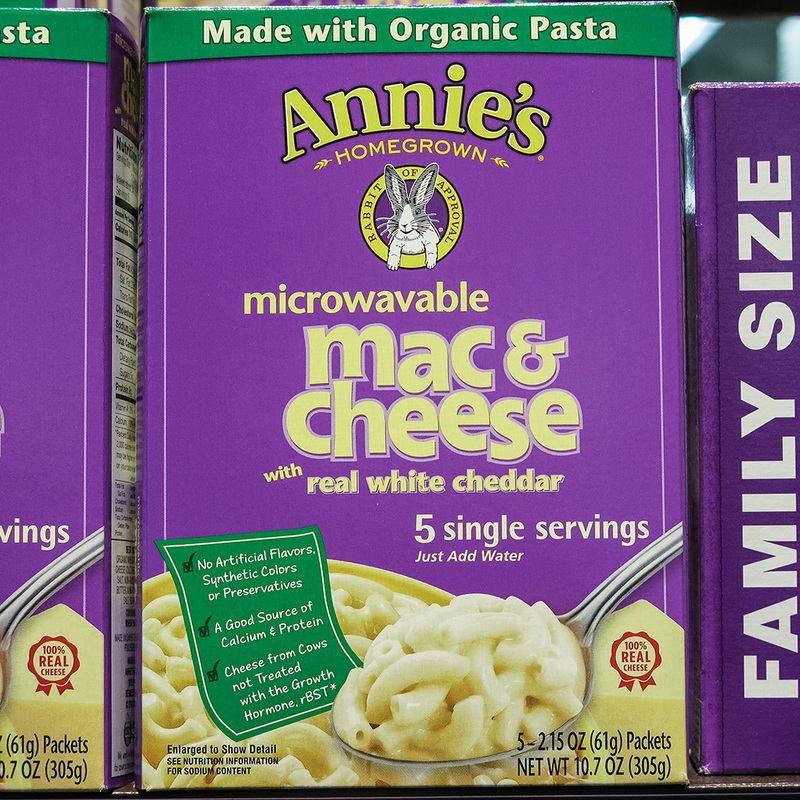 Sometimes we have a hard time telling the difference between a bowl of Annie's elbows and Kraft Easy Mac. When they were first released, the peace signs served as a great reminder of how unlike Kraft Annie's was: a small, grounded company focused on traditional values like giving kids real food. Of course, with Annie's recent sale to General Mills, the salt-of-the-earth vibe doesn't ring quite as true. But even if the message isn’t the same, the sections of the peace sign collect cheese pretty well. OK, so unless you are having your middle school graduation party this weekend, the Arthur Heads are not technically from your childhood—they arrived in the early 2000s. Still, Arthur mac and cheese can hold its own in a fight for nostalgic appeal. Who doesn't want to gorge themselves on the face of the beloved picture book character they grew up with? Bonus points: Annie’s introduced the Arthur shape to promote Bernie's Book Club, a child literacy initiative. The most varied box of macaroni on the shelf, keeping the bunny and adding three more shapes. We’re not sure about the inclusion of the carrot shape—why would anyone want to be reminded of vegetables when eating mac and cheese? But adding little pigs to the mix was a stroke of genius. The shells must have been designed by someone with an engineering PhD. The optimal shape for cheese conveyance, each shell makes a pocket containing its own little puddle of mysteriously delicious cheese. If that weren't enough, the ridges on the back of the shells offer further opportunities for cheese accumulation. The shells may not be cute, but damn, are they effective.